Planning your wedding, you hope everything goes well. But you don’t want to leave it down to vague hopes and dreams for your special day. There are certain indispensable tips for weddings that bear repeating to ensure they aren’t forgotten. Just because you think you have everything covered – check this list of wedding tips just to be sure. If you’ve decided to be your own wedding planner, understand that you must be hyper-organized. You might not naturally be that kind of person, but disorganization simply won’t work when planning a wedding. Develop a detailed, organized plan by separating out key aspects of the wedding and listing what needs to be done to satisfy them. You can use an existing spreadsheet made by someone who’s already gone through the process, survived it and got married successfully! It saves you starting from scratch and risking forgetting something important. Even if you want to create your own process, take tips on things to add to your list from the work of others. Also, add contact information to your phone for all the people you’ll be dealing with – from the photographer to the place of worship to the venue to the florist. This way, you can jump right on any last-minute issues that arise while you’re at work. You won’t get bogged down with problems or be stressed out about your wedding. If you’re not careful, the guest list will keep growing and growing. Keep in mind that the average wedding guest needs up to 20 square feet of space at a reception. This prevents the room feeling cramped. Whether moving around between dining tables or having a dance floor that’s large enough, the size of the venue is dictated partly by the guest list. List out the guests and make a count. Once you’ve booked the venue, you cannot add more guests from that point on. If the wedding is planned in a city that gets swarms of mosquitos or flies in a certain month, plan around it. 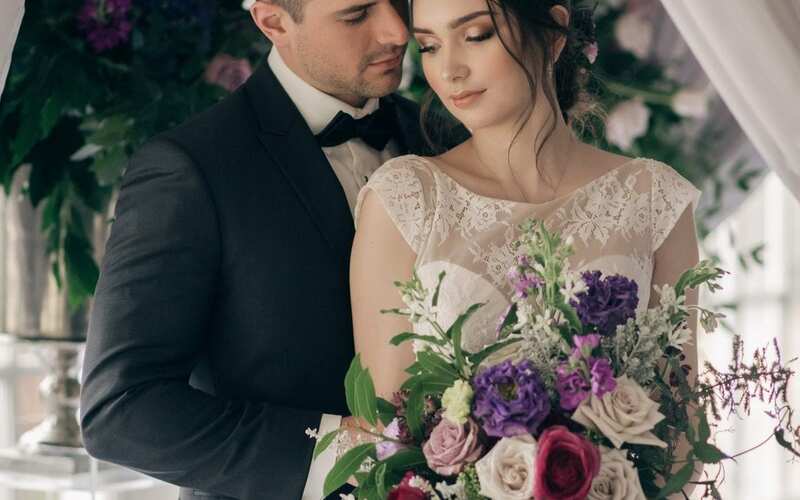 Do temperatures soar to an uncomfortable level a couple of months of the year and do you want to have your wedding during either of those months? Is there a major industry and national event that clashes with the date you’re thinking of setting for your wedding date? If many of your guests work in this industry, that could be a problem. Do some research and plan a suitable wedding date to avoid obvious date clashes. Given the cost of the average wedding, it’s a good opportunity to charge up your wedding-related purchases on a credit card. Check what available credit you have and talk to the card issuer about bumping the credit limit. Ensure you have the money to repay the balance in full when the bill comes to avoid excessive interest charges or late fees. If you’re flying to a wedding venue or away on your honeymoon, see about booking with an airline that lets you use frequent flyer miles. Perhaps you can offset your wedding expenditure to reduce the cost of the flights? A wedding photographer takes many photos on the big day and at the reception. The process of receiving the photos is often slow. Not every bride and groom get to decide what the best shots were. The ones that the photographer selects might not be their best side or will catch the expression they’d like to see on photos that will be distributed to friends and family. Make sure your wedding photographer offers proof photography. Using proofing with photos, the images are viewable online in a secure way. The newly married couple can pick the snaps they prefer and create a wedding photo collection based on their chosen shots. Adding suggestions to a photo as feedback allows the photographer to apply some filters or editing to resolve something that’s spotted but can easily be fixed. Proofing photography services on format.com are affordable and might be something that the photographer hasn’t started using yet. Insist they start with your booking to get greater control over your wedding album. Weddings tend to have a runaway budget if you don’t manage them well. You might not realize it, but the list of attendees is a major factor in the cost of the wedding. Entertaining the guests who’ll eat and celebrate with you pushes up the sticker shock. Reducing the guest list to close friends and family can cut your wedding costs by 20-30%. It’s a little unexpected, but sometimes the catering staff eat as well as the wedding guests. So, if your guests are enjoying some delicious delicacies, so are the people paid to serve them. This is one of those surprising extra expenses that gets bundled in or tacked on. While you should certainly ensure that everyone who helps during the wedding day get meals and refreshments, it doesn’t have to be from the same menu. Whether it’s extra time at the place of worship or some additional speeches by extended family members, you often need more time than you might think or plan for. Negotiating early on for an extended booking at the same price is easier to do. Trying to get that addition when almost everything has been set in stone is a tough ask. Check with married friends to see how long they needed and plan your bookings accordingly. When most of the wedding guests like to drink, you may need more bartenders than you’d expect. As a rule, one bartender for every 40-50 guests is typical. However, if the tastes of most guests lend themselves toward exotic cocktails and other drinks that take time to make, then extra bartenders may be required. If cocktails are what everyone will want, consider getting a mixologist who specializes in making cocktails. Every place of worship or venue has a list of what’s not acceptable. For places of worship, it might be a hemline of a certain level or having the shoulders covered. At wedding venues, especially receptions held outside, there could be other restrictions to be aware of. These could be related to decibel levels or conduct unsuitable for the venue. Check beforehand to avoid problems on the day. While these venues should be informing you of their requirements, not all of them will remember until the issue comes up or they’re asked directly about it, so ask for a complete list. Planning your wedding day is best done by the person in the relationship who is most organized. It is just a matter of having a solid plan, staying focused on the tasks to be accomplished, and getting everything done on time. Not everything will work out exactly as planned, but if you’re prepared to seek suitable alternatives when necessary, you won’t come unstuck too often.